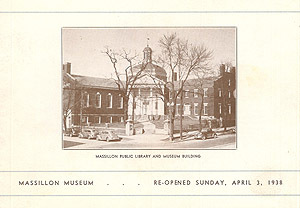 Pamphlet from the reopening of the Massillon Museum in 1938. The Massillon Museum occupies the building erected in 1830 by James Duncan, founder of Massillon, as his residence. It was bequeathed to the Massillon Public Library Board as a site for a new main library and museum by Mrs. Frank L. Baldwin in 1931. Isaac B. Dangler, a prominent merchant, and his family lived here from 1855 until it was purchased by Dr. and Mrs. J. P. Barrick in 1880. Mrs. Barrick was the mother of Frank L. Baldwin. Mr. and Mrs. Baldwin (nee Annie Steese) together planned to establish their home as a Museum because of its historic significance. It was opened as a Museum in February 1933 with Mr. C.L. Baatz in charge. A committee under the chairmanship of Miss B. V. R. Skinner was appointed. In June 1934, Miss Ruth A. Hubbard was named director, serving until August 1935. At this time the plan of changing exhibits every month or six weeks was inaugurated and proved most successful with increasing interest and attendance. Albert E. Hise continued the program until the Museum closed in May 1936 for reconstruction and the building of the adjoining main library. The library was completed and opened in October 1937. A museum committee with Mrs. M.A.W. Pratt as chairman was appointed by the library board. Additional repairs and improvements were found necessary so that the reopening of the Museum was delayed until April 3, 1938. Case contains examples of gold, silver and copper lustre. Colonial furniture, examples of Chippendale and Hepplewhite. Exhibit of costumes and crafts from several European countries. History of Photography in Massillon from 1843 to 1938. The Fletcher material has been assembled through the kindness of Miss Lillian M. Fletcher of Los Angeles, Calif., the Smithsonian Institution and the Los Angeles Museum of History, Science, and Art. Early Massillon room. This has been arranged with furniture owned by the Museum with additional pieces representing the two families who lived in this home the greatest length of time: the Isaac B. Danglers and the Frank L. Baldwins. Recital on the harp by Mrs. Wellington W. Pease. Science room. Primarily to interest children in nature study. Terraria, aquaria, pond life, charts, geological exhibits. Shell room. The Ella O. Shoemaker collection of shells presented by the Burroughs’ Nature Study Club. Gallery of changing art exhibits. Paintings of the Barbizon school from the Alphonse L. Lovencon collection. Included are landscapes by Leon Richet, Charles Daubigny, J.B.C. Corot, Theodore Rousseau, Jules Dupre, Georges Michel, Marie Detailled and others. J. J. Henner, E. Isabey, E. Lavielle, Rozier and Pail are represented by other subjects. Art objects of this period are lent by local citizens. Collection of Folk Art. Pioneer Kitchen. Crane to be hung and fire lighted by the Northwest Territory Sesqui-Centennial Expedition, April 19, 1938. Maps of Massillon owned by the Museum. Vigilant, the hand-pumped fire engine used in Massillon. Broadsides advertising July 4th Celebrations in Massillon. History of some of Massillon’s industries, past and present, told in pictures and charts. Children’s alcove. Working models and school loan exhibits. Work-shop for crafts. Class-room for the making of art pottery. The Dr. A. Per Lee Pease Archaeological and Ethnological Collection, the Massillon high School Alumnal Historical Collection, the Ella O. Shoemaker Shell Collection, the Catherine Patton Wallace Collection of Indian Baskets and Pottery, the Melvina Dangler Young Memorial Collection of Glass and China, the Hise Collection of Folk Art. The Museum has assembled a collection of paintings by William Thomas Mathews, known as ‘The Painter of Presidents’ who lived in this city for some time. Material pertaining to Abel Fletcher, inventor of the paper negative, who made his experiments in this city has been collected.